Sunday’s article, Titanic: The HMS Hawke, The SS New York, & Captain Smith, will introduce you to a side of Captain Smith no one has seen for 100 years. 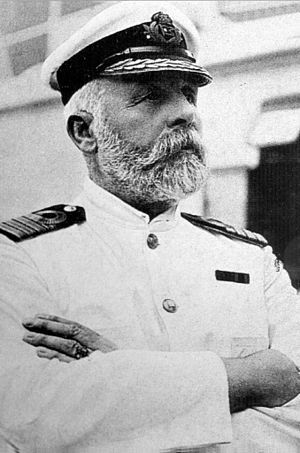 Walter Lord said that “… ships had gotten too big for Captain Smith.” The celebrated Titanic author said that Captain Smith wandered away in a daze after the disaster, and described Captain Smith as indecisive. One blogger on wordpress wrote such a tirade on Captain Smith it hurt my eyes just reading it. For 100 years Captain Smith has been maligned. Now you will discover the rest of Captain Smith’s story, and you will discover why so many have gotten Captain Smith wrong. The evidence has been right in front of our eyes for 100 years. It needed a mariner and researcher to identify the clues and point them out for the rest of the world to see. Nothing surmised or made up, just connecting the dots of over looked and seemingly meaningless actions, misunderstood evidence, and testimony. Authors and researchers describe Captain Smith as a man admired and respected by subordinates, peers, seniors, and passengers alike. They describe how Captain Smith never raised his voice with subordinates, and yet was always, willingly, and enthusiastically obeyed by juniors. Then they proceed to describe him as outdated and indecisive during the disaster. There is a reason professional mariners admired, respected, and enthusiastically followed Captain Smith; and this Sunday’s article will reveal those reason’s to you. The conclusion of, Report Into the Loss of the SS Titanic – A Centennial Reappraisal, is that First Officer Murdoch waited for 30 seconds after Frederick Fleet rang the crow’s-nest bell three times (signalling an object directly in front of Titanic). My review is based on Samuel Halpern’s article 30 Seconds Lost, which is based on his book, Report Into the Loss of the SS Titanic – A Centennial Reappraisal. The article’s conclusion is based on testimony by Robert Hichens and supported by testimony from other men on duty at the time, men who gave testimony at the 1912 investigations. Unfortunately, as stated for the record in the transcripts, the officials of the Wreck Commissioners’ Court (the 1912 British investigation) found Hichens testimony conflicting. If you read his testimony from both investigations I am sure you will agree. The commissioners concluded that Mr. Hichens statements as to the events that took place was accurate, but his timing was off. Yet, none of the conflicting information is presented in the new report. Mr. HITCHENS. I would like to make a little statement as regarding Mrs. Mayer’s statement in the newspapers about my drinking the whisky sir, and about the blankets. I was very cold, sir, and I was standing up in the boat. I had no hat on. A lady had a flask of whisky or brandy, or something of that description, given her by some gentleman on the ship before she left, and she pulled it out and gave me about a tablespoonful and I drank it. Another lady, who was lying in the bottom of the boat, in a rather weak condition gave me a half wet and half dry blanket to try keep myself a little warm, as I was half frozen. I think it was very unkind of her, sir, to make any statement criticizing me. When we got to the ship I handled everyone as carefully as I could, and I was the last one to leave the boat, and I do not think I deserve anything like that to be put in the papers. That is what upset me and got on my nerves. As if this were not enough, Hitchens was on his way back to Southampton and his family on the steamship Lapland when he was put into the pilot boat and sent back so that he could testify before the senate. Hitchens did not know, at the time of his testimony, if the White Star Line would pay for his return passage or if he was on his own. Add all of this and the disaster he had just survived and it is understandable if some of his testimony was contradictory. 1314. You were given the order to hard-a-starboard? – Yes. 1315. Was that the only order you had as to the helm? – Yes. Mr. Holmes: Because, if your Lordship will remember, the evidence of the Witness Scarrott on Friday was quite the contrary, when he came up on deck. The Commissioner: What did he say? Mr. Holmes: He said that the ship appeared to be under a port helm, and appeared to be going around the iceberg towards the starboard side. The Commissioner: Did he say so? The Attorney-General: Yes, I think so. 1316. (Mr. Holmes.) It is Question 354. (To the Witness.) She never was under a port helm? – She did not come on the port helm, Sir – on the starboard helm. Obviously this was not true, others had witnessed Titanic on a port helm and the scientific evidence bears this out. If what Hichens said was true, Titanic would have been damaged along the entire starboard side of the ship. Mr. Halpern also quotes lookout Lee, who was on duty with Fleet, to bolster his assertion that Mr. Murdoch waited 30 seconds to turn Titanic. As soon as the reply came back ‘Thank you,’ the helm must have been put either hard-a-starboard or very close to it, because she veered to port, and it seemed almost as if she might clear it, but I suppose there was ice under water. Clearly, Lee was saying that the helm must have been put hard-a-starboard soon after Moody’s reply of “thank you” was given to Fleet, not before. And we know from Hichens that Moody repeated what Fleet had just reported on the phone to First Officer Murdoch who then gave the order to put the helm hard-a-starboard and then rushed to the engine telegraphs to ring down orders to the engine room. From their vantage point high up in the crow’s nest, Fleet and Lee watched as the ship veered to port “a little over a point, or two points…until the iceberg was alongside of her.” The iceberg then seemed to strike “just about in front of the foremast” on the starboard side. Clearly what Mr. Lee testified to was not physically possible. If Titanic had been put hard-a-starboard after Mr. Moody said “Thank you” it would have taken approximately 10 seconds before Titanic would have “veered to port.” If Titanic veered to port as soon as the reply came back “Thank you”, then clearly the order was given as least 10 seconds before. Also, with tests on the RMS Olympic it was determined to take 37 seconds from the time the order hard-a-starboard is given for the ship to turn 2 points (this was on a continuous left turn, with no turn to the right). This is supported in the ship handling tables of the United States Navy for ships of this size at the speed of 22.5 knots. When I was doing this bit of duty I heard three bells rung up in the crow’s nest, which I knew that it was something ahead; so I looked, but I did not see anything. I happened to be looking at the lights in the standing compass at the time. That was my duty, to look at the lights in the standing compass, and I was trimming them so that they would burn properly. When I heard the report, I looked, but could not see anything, and I left that and was just entering on the bridge just as the shock came. I knew we had touched something. Senator BURTON. Do you know whether the wheel was hard-a-port then? Mr. OLLIVER. What I know about the wheel – I was stand-by to run messages, but what I knew about the helm is, hard aport. Senator BURTON. Do you mean hard-a-port or hard-a-starboard? Mr. OLLIVER. I know the orders I heard when I was on the bridge was after we had struck the iceberg. I heard hard-a-port, and there was the man at the wheel and the officer. The officer was seeing it was carried out right. Senator BURTON. What officer was it? Mr. OLLIVER. Mr. Moody, the sixth officer, was stationed in the wheelhouse. Senator BURTON. Who was the man at the wheel? Senator BURTON. You do not know whether the helm was put hard-a-starboard first, or not? Mr. OLLIVER. No, sir; I do not know that. So, let’s look at the events as Fleet and Hichens describe them, add what we know (according to physics) must have happened and see what we get. Fleet said the ship turned about one point to port and Hichens clearly stated the ship turned two points to port (one point is 11.5 degrees). We know Titanic was, at some point, turning to starboard because only 300 feet of the ship was damaged. 2. 10 seconds (at T-0 + 10 seconds) later the wheel is hard over, and the ship will have turned about 2 degrees to port. 3. 23 seconds (at T-0 + 23 seconds) Titanic has turned one point to the port ( 11.5 degrees to the left). Hard-a-port order is given. 4. 35 seconds (at T-0 + 35 seconds) the rudder passes through the center position on it’s way to hard-a-port. 5. About 3 seconds after that (at T-0 + 38 seconds) Titanic’s bow stops swinging to the port (left) at about 19 degrees, or almost 2 points. From this point on the bow will be turning towards the right (starboard) and the stern will be swinging towards the port (left). 6. 43 seconds (at T-0 + 43 seconds) the rudder reaches hard-a-port, and has now been completely shifted from hard-a-starboard to hard-a-port. Hichens was looking at the compass and could see nothing outside of the wheelhouse, which is inside the enclosed bridge. Hichens testified that the blinds in the wheelhouse were closed, and were always closed at sunset. Fleet had no compass. Fleet’s statement of heading is a rough estimate. It is possible that what Hichens remembers is the maximum swing of the bow of the ship before it started to come back to the right, but this is only a guess. Remember also, Mr. Murdoch was not looking at a compass. He was watching the approach of the iceberg, he was trying to time his right turn based on the position of the iceberg to the ship. The six steps I gave above are based on tables from the United States Navy on handling characteristics for a ship the size of Titanic at the speed Titanic was going. They do not represent the exact times as they happened on the Titanic on the night of 14 April 1912. But they are close and we know this sequence of events must have happened. 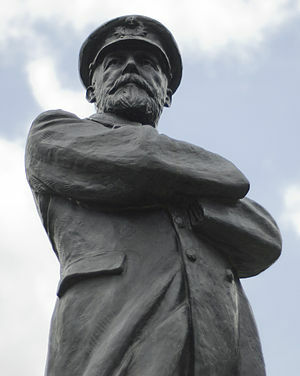 Scarrott saw Titanic’s stern moving to the left away from the iceberg (Titanic turning to the starboard on a port helm). We know that only 300 feet of Titanic was damaged. One other point. Before the 3 bells were rung by Fleet, Mr. Moody was in the wheelhouse (Hichens testimony) and Mr. Murdoch was on the bridge wing. If Mr. Murdoch was thinking for those 30 seconds as Mr. Halpern suggests, Mr. Moody would have immediately picked up the bridge phone answering the lookouts. As Hichens stated in his testimony, everyone knew what 3 bells meant. As the junior officer in the wheelhouse, that was one of Mr. Moody’s duties. 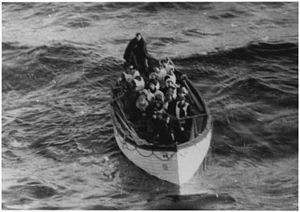 As I stated in my article Titanic: “Iceberg Right Ahead!” – Conventional Chronology Wrong (http://wp.me/P1MLkF-70) Mr. Moody could not answer the phone when it rang because he was already standing behind Hichens to ensure Hichens was carrying out the hard-a-starboard order. Fleet was on the phone for about half a minute as he stated, because Mr. Moody could not pick up the phone on the bridge. Moody was watching Hichens turn the wheel. Moody reports the wheel is hard over, hears Mr. Murdoch acknowlegde his report, walks to the phone answers and relays the lookout report to Mr. Murdoch. Mr. Murdoch orders hard-aport. Fleet is off the phone and Titanic’s bow has turned one point to the port (left). The bow continues to swing to the left while Hichens is turning the wheel to hard-aport. Before the wheel is over hard-aport, the bow begins to swing back to the right and Titanic hits the iceberg. Everyone, on the bridge and in the crow’s-nest, would have adrenalin coursing through their veins at this time. Not only were these 30 seconds stressful, but there were many things happening in quick succession. How well do you think your memory would hold up? If you look once more at those 6 steps again you will notice that 23 seconds after Murdoch gave the order hard-a-starboard Titanic would have turned about one point. 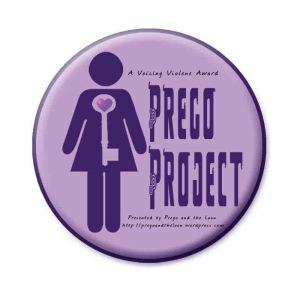 When you do not have a watch (the lookouts testified they did not), and with the stress of the moment, 23 seconds could seem like “half a minute”. Also, if we take into account the errors in his testimony that we can prove, and we look at the 6 points again. We notice that at about 23 seconds Murdoch would have given his hard-a-port order. It is possible, this is a guess, that those 23 seconds seemed to be half a minute as Hichens testified and he was remembering the hard-a-port order that came after “half a minute” and not the hard-a-starboard order. Hichens clearly stated no hard-a-port order was given, physics clearly shows there was a hard-a-port order given, as does the testimony of other crewman. Clearly Mr. Halpern’s chronology is wrong. We will never know if Mr. Murdoch gave his “hard-a-port” order 21, 23, or 25 seconds after he gave the “hard-a-starboard” order. But, we know he gave it. We also know that if Mr. Murdoch had waited 30 seconds after Fleet rang the bell before giving the hard-a-starboard order, Titanic would have still been turning to the left and the stern would have been swinging to the right, into the path of the iceberg when the iceberg struck. At Titanic’s speed, even if Murdoch would have ordered “hard-a-port” when the iceberg struck, Titanic would have taken about 38 seconds before Titanic’s bow began to turn to the right (step 5 above). At Titanic’s speed she would have traveled more than 1,000 feet in 38 seconds, Titanic would have been opened to the sea along the entire starboard side. I could go into more detail, however a 3,000 word article is quite enough for now. Look for my upcoming article on Murdoch’s “hard-a-port” order for the conclusion on this topic.